Jobs growth – payback time? US non-farm payrolls surged 312,000 in December with a net 58,000 upward revisions to employment for October and November. This was way ahead of the 185,000 consensus expectation and left 2018 as the best year for job creation since 2015. The US economy is in good shape, but we surely can’t get a repeat of this for January 2019? For starters, the 20% plunge in the S&P 500 through 4Q18 reflected growing fears about escalating trade protectionism and what it might mean for global activity. 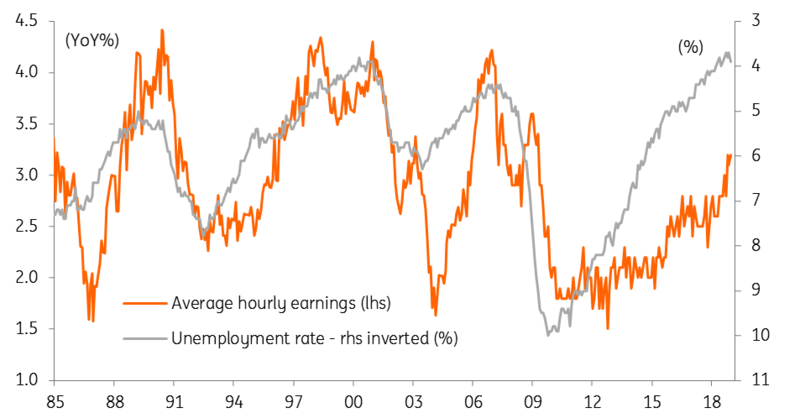 This is likely to have made business somewhat wary and that could translate into weaker hiring at the start of this year. Then there was the government shutdown. While those 800,000 government workers impacted will still be included in the payrolls, there were many government contractors that weren’t working and this could be a downward influence on the overall payrolls number. In general, we expect 2019 to see slower payrolls growth than we did in 2018. There are more headwinds facing the US economy, such as the fading support from the fiscal stimulus, lagged effects of higher interest rates and the strong dollar plus ongoing fears about trade protectionism at a time of weaker external demand. This is likely to mean that hiring will probably slow. Arguably a bigger constraint in the near term is the lack of available workers to employ. The National Federation of Independent Businesses reports that 39% of US small businesses have vacancies that they cannot fill – an all-time high for a survey that has been running for over 40 years. Unemployment is at a 49-year low with the latest Federal Reserve Beige Book noting that labour markets were "tight” in all districts of the US and that “firms were struggling to find workers at any skill level”. Taking it all together, we forecast payrolls growth of 140,000 versus the consensus economist survey of 165,000 which ranges from +230,000 all the way down to -40,000. We are now seeing wage pressures clearly rise in the US with the annual rate of pay growth running at 3.2%. We think it will continue rising given the intense competition to find suitable workers when unemployment is at multi-decade lows. The Federal Reserve Beige Book noted that “wages grew throughout the country… across skill levels, and numerous Districts highlighted rising entry-level wages as firms sought to attract and retain workers and as new minimum wage laws came into effect”. Non-wage benefits are also increasing as firms compete for labour. This means more generous pension, healthcare and vacation packages plus the growing prevalence of signing bonuses. We forecast a 0.3% month-on-month gain in wages, in line with consensus, which would keep the annual rate of pay at 3.2%. However the next couple of months will see some favourable comparisons with last year (which saw relatively low MoM increases). Given the increase in pay pressures we are now seeing this could help drive the annual rate of wage growth above 3.5% during the spring. The unemployment rate was the one disappointing piece of news in last month’s jobs report. It rose from 3.7% (the lowest level since December 1969) to 3.9% last month on rising participation in the workforce, but this data tends to be choppy and we expect to see a partial reversal back to 3.8%. Indeed, with initial jobless claims and continuing jobless claims falling to the lows of the late 1960s, unemployment is highly unlikely to rise in the near-term in any meaningful way. We also expect the measure of underemployment (including those that are working part-time but want a full time job and those that are contractors but want a permanent position) to fall back to 7.5% from 7.6%. This time last month financial markets were implying there was a greater chance of an interest rate cut than a rate hike this year. However, a recovery in equity markets, the ending of the government shutdown, and some cautious optimism on the outlook for US-China trade talks now see around 10 basis points of policy tightening priced in for this year. We think this still underestimates the probability of interest rate increases from the Federal Reserve. Any slowdown in jobs growth this month is as much due to a lack of available workers as it is to a slowdown in hiring intentions after a bumper end to 2018. With worker pay on the rise and employees feeling secure in their jobs, consumer spending will likely remain firm while adding to inflation pressures in the economy. As such, we continue to look for two more rate hikes this year, starting with a move in late 2Q.